Please type in your postcode or town and country into the box above and click on 'Get Route' to get your personalised directions. Look out for the signs for the Safari Park and follow them. Following Safari Park signs through Kidderminster towards Bewdley. Take the A449 to Kidderminster. 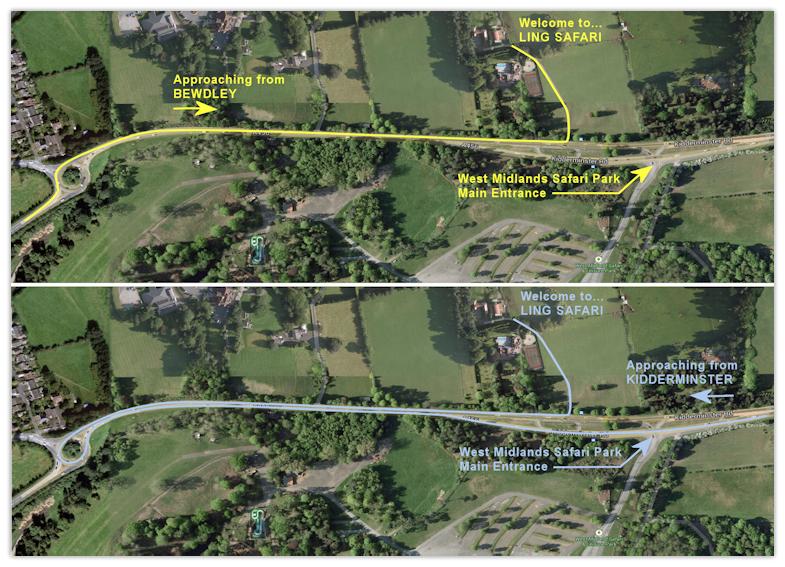 Then take the A456 towards Bewdley. Follow them towards towards Bewdley. The nearest mainline railway station is Kidderminster, approximately 4 miles from Ling Safari. Trains are operated by 'London Midland' - www.londonmidland.co.uk. The nearest bus station is Kidderminster, approximately ½ mile from the train station. You will need to catch a bus to Bewdley. Bus stops are located on both sides of the carriage way outside the entrance to the West Midlands Safari Park. From the bus stop it is a 5 minute walk up the farm track to Ling Farm. Buses are operated by 'First' - www.firstgroup.com.